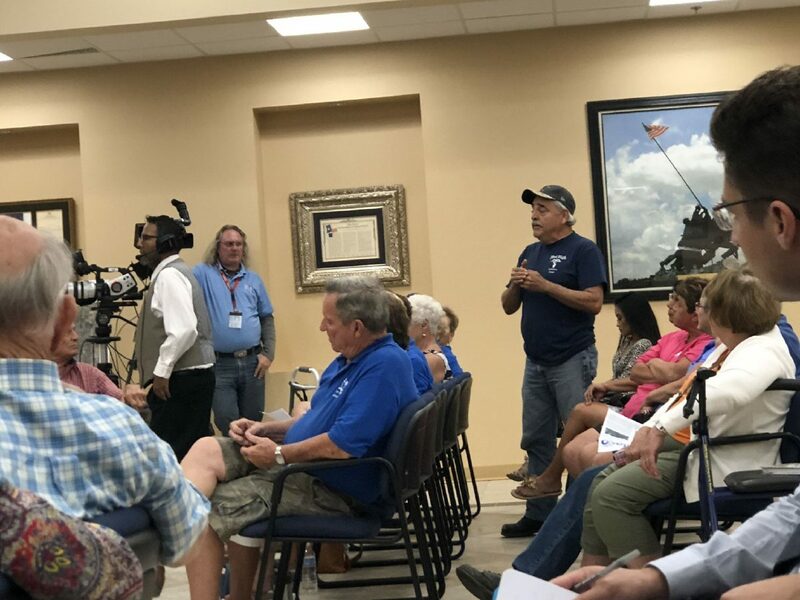 WESLACO — Various citizens attending a lengthy city commission workshop Tuesday stood up frequently to question and even occasionally berate staff and commissioners out of frustration caused by last month’s flooding. The citizens — some from the mobile home park Leisure World, another from the central part of city and even one who lives outside city limits — asked the commission, city manager and staff about drainage operations during the workshop and special meeting held to make progress in improving drainage. Commissioners discussed short- and long-term solutions to drainage within the city, including constructing regional detention facilities meant to hold and release water, implementing stricter subdivision requirements, creating a committee of citizens focused on drainage, renting an extra piece of equipment to clean crossings where rainwater flows and issuing certificates of obligation for additional funding to complete the costly work. “It’s a lot of discussion, but it’s a lot of direction,” City Manager Mike Perez said following the meetings. Potential solutions discussed during the more than three-hour meeting will likely appear on the Aug. 7 meeting agenda. The items need commission approval to pivot city resources to drainage upgrades. During the workshop, Public Works Director Pete Garcia, whose department cleans drainage ditches, detailed the work done by crews who clean and widen the drains every year. The cleaning of ditches and culverts in the city have become a concern among residents, who place blame on commissioners and staff, following the series of storms late last month which dumped a substantial amount of rain within a few hours and continued throughout the day, about 16 inches total. A flood of that magnitude, while unlikely in any given year, caused the commission to focus on drainage improvements and to take a closer look at the master drainage plan study conducted by Gonzalez De La Garza CFZ Group in 2015. Though the city has completed some of the drainage plan, finishing it entirely would cost $318 million, 12 times the amount in the city’s general fund this year. The plan suggests the city conduct a 2-D “study” of the city, but unlike the study completed in 2015, it would involve mapping the topography of the city to assist engineers in prioritizing improvements to the drainage system. The program would allow engineers to see where improvements, like adding pipes, would be best utilized and where additional infrastructure might cause further flooding in certain streets. Planning Director and City Engineer Mardoqueo Hinojosa presented a report about the amount of silt accumulated inside pipes following the flood. “With a lot of the flooding we had, you always have silting because it picks up all the mud along the road,” Perez said. City crews are scheduled to begin cleaning out the silt buildup from drainage culverts. In addition to staff’s suggestions, the commission often heard from residents in the audience. Sandra Reyna, who lives off Pat Cannon Street in Weslaco, suggested the city record videos of work being done as a way to hold the city government accountable for completed drainage maintenance. “We’ll be watching,” Weslaco citizen Randy Hall said.